visibleAUDIBLE visibleAudible is an audiovisual art installation. It gives a tangible, physically touchable experience on sound visualisation, using modern technology only where necessary and focusing on the analogue and physical properties of sound and light, using mirrors, fuids and a speaker. Big thanks to Pretty Lights Music. At the centre of the installation, there is a round spot of white fluid. The light that shines onto this white spot is coming from three light sources at a very flat angle. 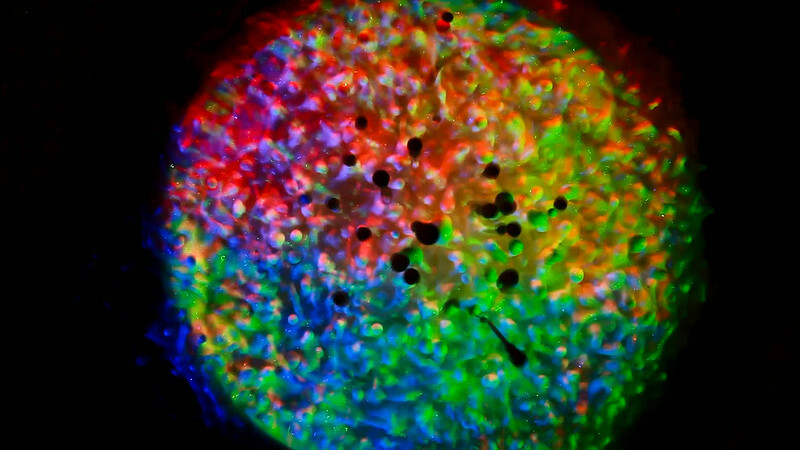 Those light sources, located around the spot, produce light in three primary colours – Red, Green and Blue. 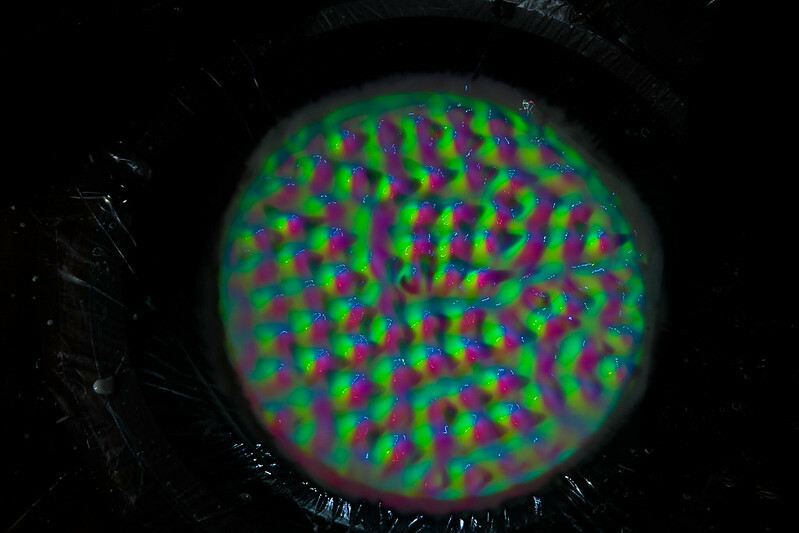 On the white spot, those colours sum up to white, so no difference to a single white light source can be seen. Any object near to the surface, however, will throw three shadows. Imagine a sports field with a spotlight in each corner – the athletes on the field throw four shadows. However, the shadows each take away only one colour of the three primary colours, making the shadow not dark, but colourful; as it is an additive colour system the shadows will be Yellow, Cyan and Magenta. The object itself will appear in Red, Green and Blue, creating a very lively mixture of what seemed to be simply white light. 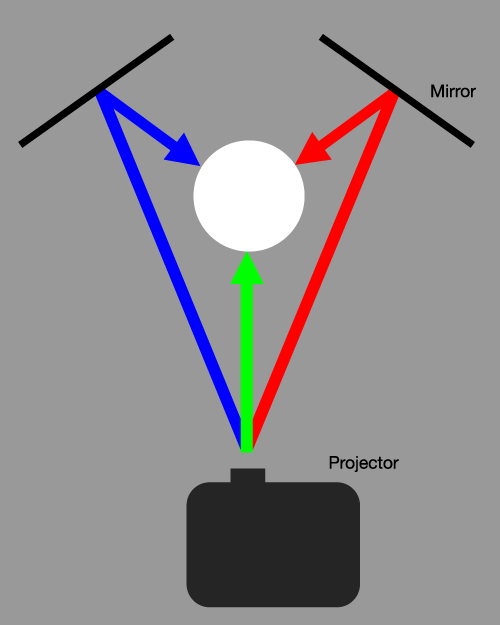 Using one video projector and two mirrors, it is possible to create the needed light sources. 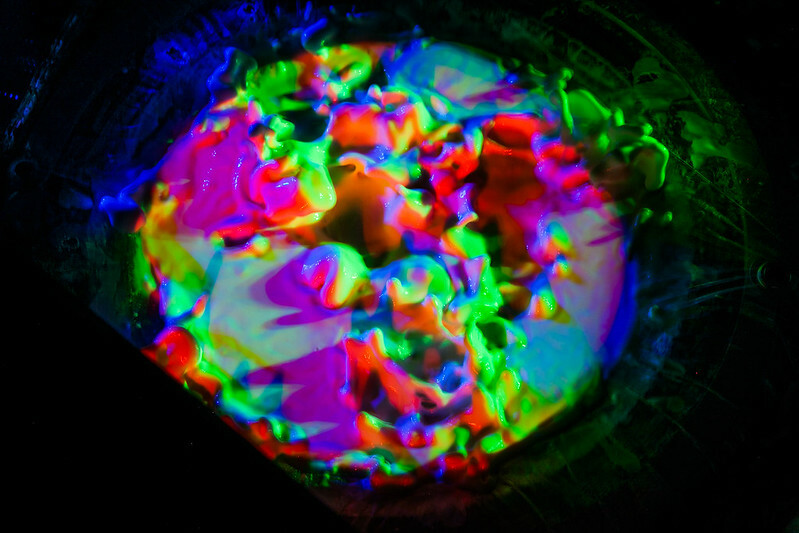 Additionally, by using the techniques projection mapping and texture mapping, the light can be controlled to only reach the desired spot and add up to seemingly perfect white. This principle – a seamless, white spot turning colourful when anything throws a shadow onto it – also applies to waves on the fluid (a white fluid is used to have the best canvas for coloured light). As soon as the surface is not completely flat, the waves themselves cast shadows and become visible in a very colourful way. The fluid is located inside the cone of a speaker. This is where the translation between sound and light happens: every sound played by the speaker, every vibration will be visible on the surface of the fluid. Those waves will appear in colourful variations, depending on frequency and altitude of the sound as well as the viewer's position. As an addition, a non-newtonian fluid (e.g. corn starch with water) can be used instead of a standard white fluid. This kind of fluid changes it's viscosity depending on the pressure applied to it. 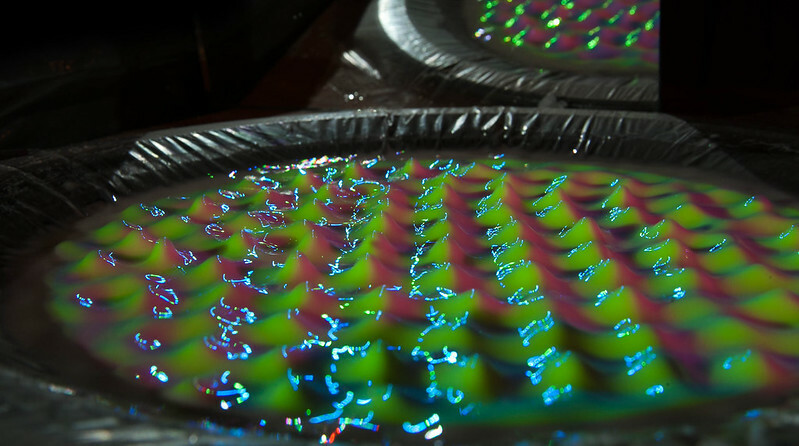 When exposed to strong vibrations, a non-newtonian fluid will create shapes and bodies, seemingly alive, representing sound and vibrations in unique and exceptional ways. This phenomenon is especially interesting when used in context of this project – the abstract shapes build up to colourful patterns and figures. This is one of the most abstract, yet most interesting experiences that can be achieved with this installation. A certain randomness – even when the same sound is played, the shapes differ every time – and abstractness seemingly lowers the direct bond between sound and visualisation, yet everything that can be seen is completely based on and created by the vibrations and sound. 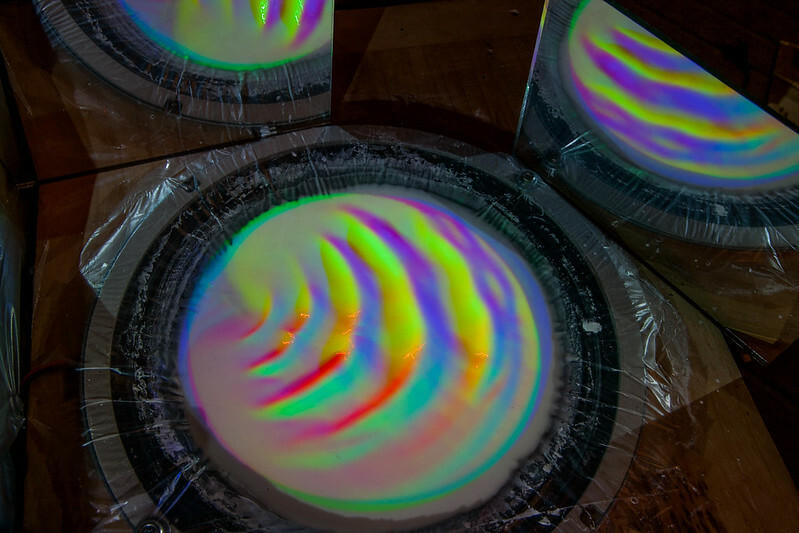 Works like 'Wellenwanne' by Carsten Nicolai or various other works in the field of Cymatics (watch Evan Grant's talk on Cymatics, 2009) use liquids, including non-newtonian fluids, to visualise sound waves and vibrations. What makes this work unique is the way those vibrations on the fluid's surface are visualised. 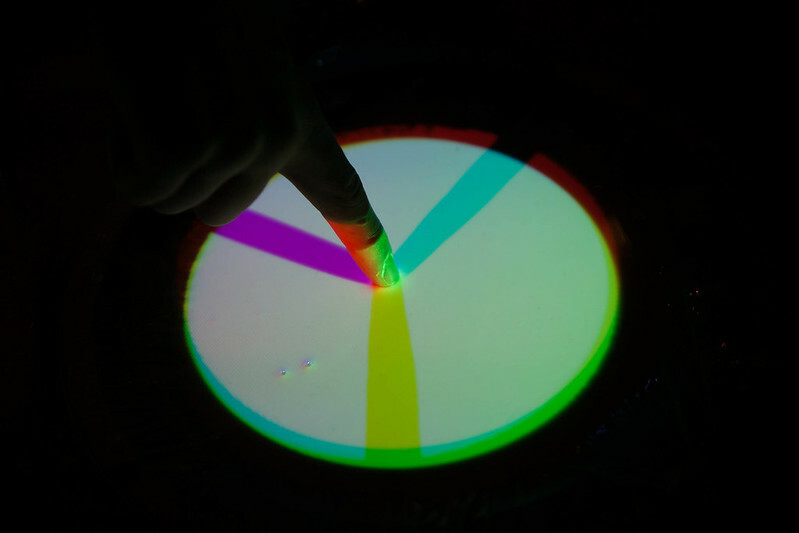 The three-way colour system, providing white light but coloured shadows, creates a new and unique way of visualising vibrations.